In a dutch oven, bring 1 inch of slightly salted water to boiling. Add squash. Cover and cook for 4 mins, drain well. Meanwhile in large bowl, stir together flour, sugar, paprika, salt, garlic powder, basil and pepper; stir in tomatoes. In 2 quart square baking dish, layer half of the squash and half of the tomato mixture. Repeat layers. Bake uncovered, in a 350 F oven for 25 minutes. Sprinkle with cheeses. Bake for 5-10 min more or until heated through and sauce is bubbly around the edges. Let stand for 5 minutes before serving. Serve with slotted spoon. 3 1/2 cups cubed zucchini, about 1 lb. Heat oil in large skilled over medium-high heat. Add zucchini and corn, cook, stirring occasionally., 7-8 minutes or until zucchini is crisp-tender. Remove from heat, and stir in cilantro and remaining ingredients. Can be served warm or cold. In a medium bowl, combine the zucchini, eggs, onion, flour, Parmesan and mozzarella cheeses, and salt. Stir well enough to distribute ingredients evenly. Heat a small amount of oil in skillet over medium high heat. Drop zucchini mixture by heaping tablespoonfuls and cook for a few minutes on each side until golden. Serve with a bit of marinara sauce or a dollop of sour cream. Combine all the ingredients in a food processor and pulse until desired consistency is reached. A simple vegetable peeler is all you’ll need to to cut the thin lengthwise strips of zucchini. Start by cutting off the ends of your zucchini then use your peeler to cut the strips, stopping and turning when you see the seeds. You’ll want to make sure you cook your strips of zucchini either in a stove top grill or saute pan coated with a tiny bit of olive oil, they only take a couple of minutes. Make sure they cool completely before adding them to your salad. I used arugula for my salad base and tossed it in a vinaigrette of 3 parts olive oil to 1 part red wine vinegar, added a touch of Dijon, a crushed garlic clove, salt, black pepper and oregano, any lemon based dressing would be work as well. 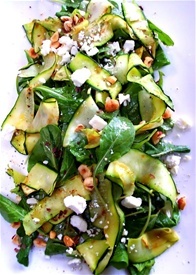 Lay your zucchini strips on top, toss in some feta or shaved Parmesan and sprinkle with toasted nuts, I used hazelnuts here with the feta, but pine nuts or slivered almonds would be just as good. To finish, drizzle a little more dressing over the top. Just let your creative juices flow and make it your own! Preheat oven to 350. Cut squash in half, scoop out seeds. Place in roasting pan cut side down in 2 inches of water. Roast until tender about 30-45 minutes. Meanwhile, melt butter in saucepan. Add honey, Worcestershire sauce and raisins. Turn squash right side up and fill with mixture. Return to pan and oven for additional 10 minutes. Cut squash in half horizontally. Scoop out and discard seeds. Place the squash cut-side down in a roasting pan with about 2 inches of water. Roast in oven until tender, about 30-45 minutes. When the squash are tender, reduce oven temperature to 325°. Turn squash halves over and fill with the turkey mixture. Top with cheese. Place on the baking sheet and bake until the filling is heated through and the cheese is melted, 8 to 10 minutes. Combine vinegar, sugar and 1/4 tsp salt until sugar dissolves. Trim ends of zucchini and squash Cut into thin ribbons with peeler. Add to vinegar mixture. Cover and chill 2 hours or overnight. Bring small pan of water to a boil...add garlic. Remove with slotted spoon after 1 minute. Rinse under cold water and set aside. Add basil to boiling water, immediately remove it and rinse under cold water. Reserve 1 tsp of cooking liquid. Transfer garlic and basil to a food processor and add lemon juice, Olive oil, reserved water and the remaining 1/4 tsp salt. Process until smooth. Drain squash and divide among 4 plates. Top with mozzarella and drizzle with basil oil. 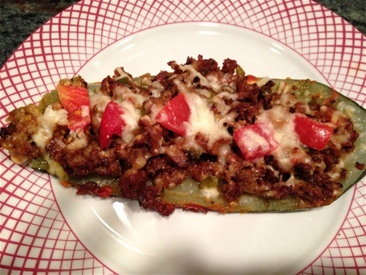 · Using spoon, fill each zucchini boat with sausage mixture. Top with mozzarella, tomatoes, and a sprinkle of parmesan cheese. · Cover with foil, bake about 35 minutes or until cheese is melted. Is pick up available at your danbury farm stand for csa members? Hi Maureen, we are now accepting applications for the 2016 CSA season. Please fill out the form on the website, return with your check and you will be set! Can I send in an application for the 2016 season now?